Spanish Apple Fries is a fresh and delicious product new to Australia. 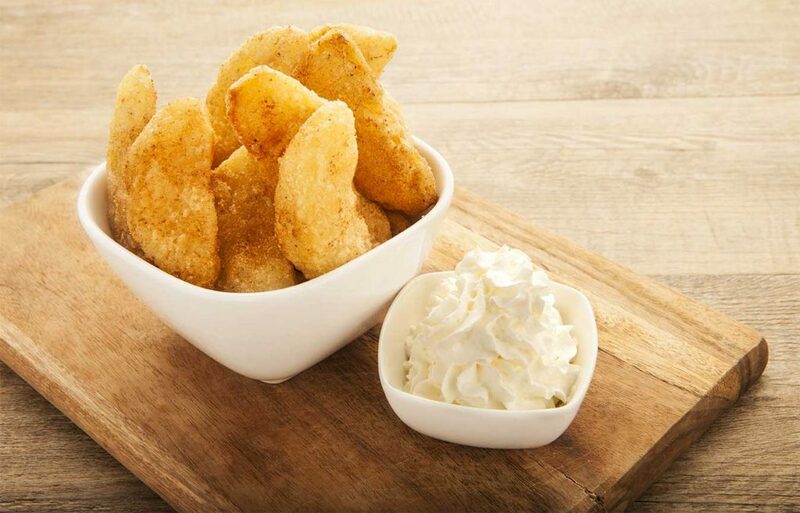 Sweet, crispy apples, peeled, sliced and coated in our secret recipe, cooked in cholesterol free oil and served with whipped cream… Yum! Spanish Apple Fries are produced by Spanish Doughnuts Foods and are available as a wholesale product Australia wide. Our automated processes convert whole fruit into apple slices. Our product can be either par-cooked frozen or delivered fresh. Our Spanish Apple Fries are available as a wholesale product to the food and hospitality industry. Spanish Apple fries will also supply your instore advertising and promotional material. In addition to our Apple Fries, our manufacturing and processing plant can also convert whole fruit into apple slices and dices, in either a fresh or frozen state according to your product specifications. Contact us today to find out more!